This enhancement to the BluBilling platform is a simple, convenient and secure way to enter a large number of payments received via checks or cash. This time saver of a screen allows you to bypass the tedious 2 step process of having to search for each customer and applying payments from their Account Summary page. Enter payments individually or upload a file to enter larger volumes and select the Submit button to record payments entered. 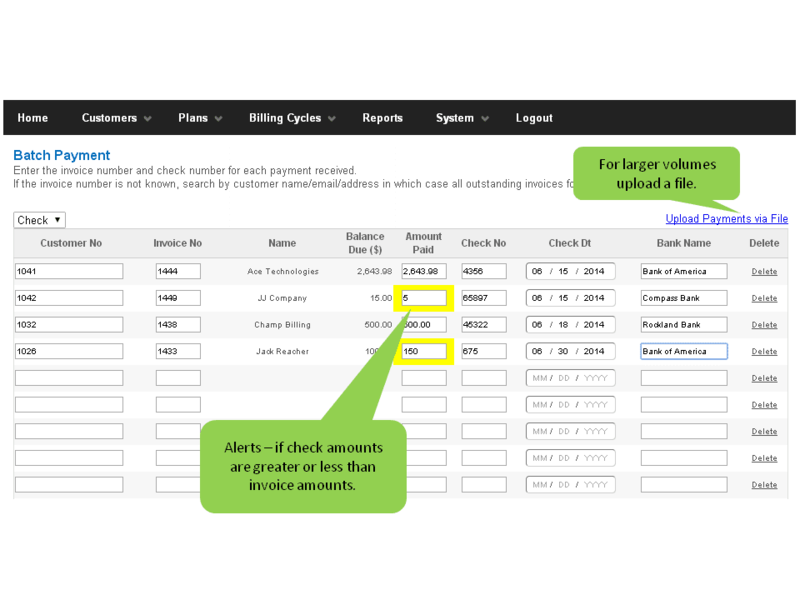 - If the check amount is greater or less than the amount due on the invoice the system highlights the amount field drawing your attention to it. - If the invoice number is not known, search by customer name/email/address in which case all outstanding invoices for that customer are populated. -Indicates the status of the invoice - if paid, you get a "This Invoice is not outstanding" message, eliminating human error. 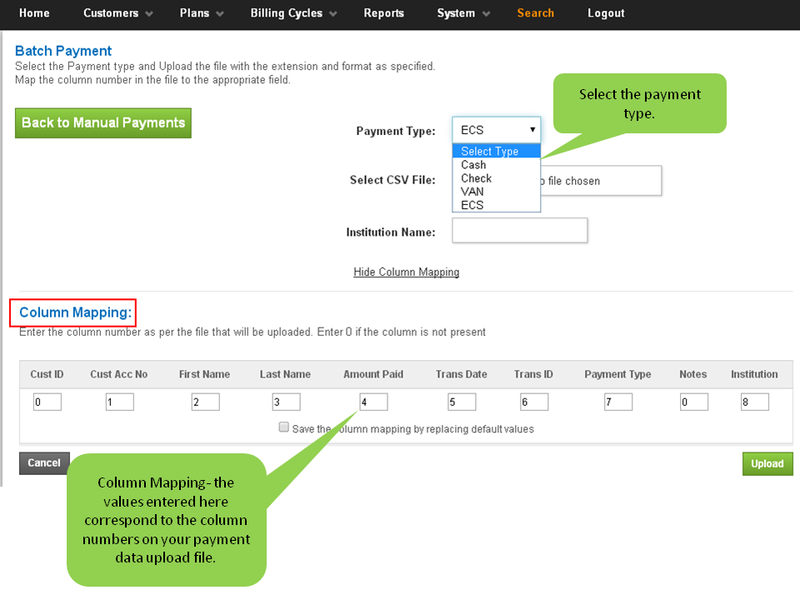 To upload large volumes of payment data, click on the "Upload Payments via file" link. See fig 1a. 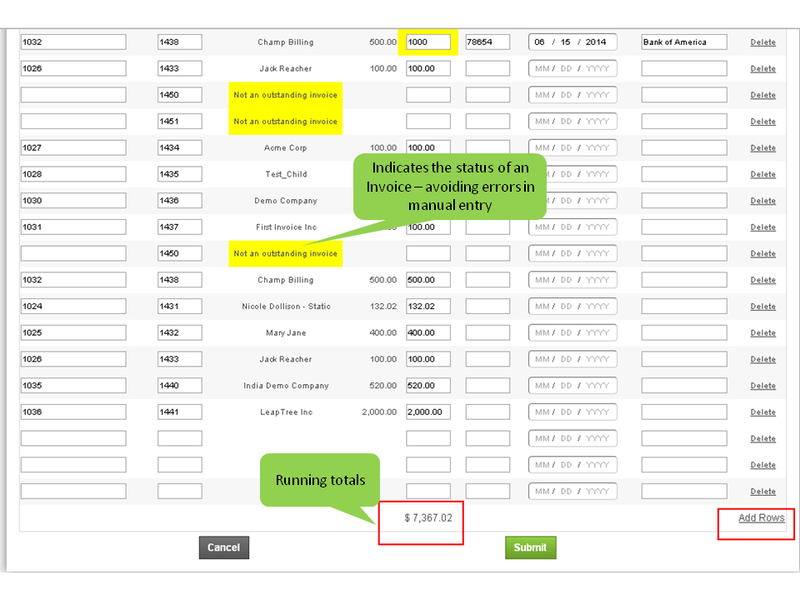 From the Batch Payments screen, click on Edit Column Mapping. The Column Mapping reflects the position of a particular column in your data upload file. So for example in Fig 2a below. Cust id = 0, this means that you do not have a customer id field in your file. Customer Account No = 1, this indicates to the system that Column 1 of your file has the Customer Account Number data. First Name = 2, indicates that Column 2 in the upload file has First Name data. -You can save the column mapping, if you would like the system to remember it, for the next time around.